I am not going to render an opinion here on Sir Shadow's art, but I will report that it is certainly a phenomenon. After gleaning his website, I see that he is on the road to becoming a one man industry. As I have written here before, it is always so surprising how one can be unaware of people, places or things in this city which are virtual institutions, in many cases having had major news coverage such as articles in the New York Times. A good example of this is Joe Ades, the Gentleman Peeler, a character who has based himself in Union Square and about whom I have previously posted - see here. 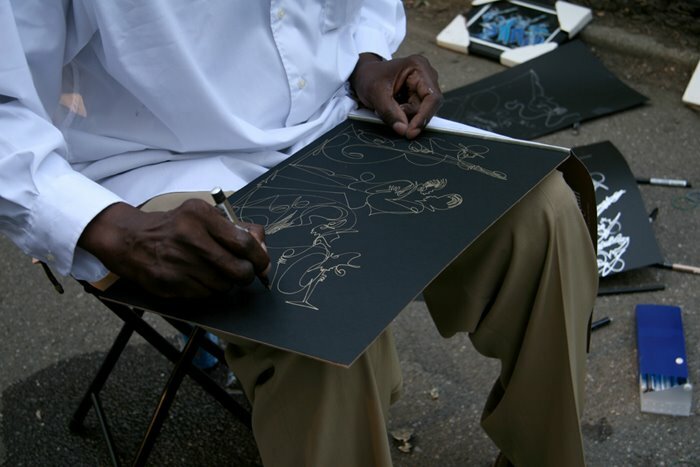 Sir Shadow, 59 years old, was born Thomas Allen Paxton and grew up in Jamaica Queens, New York. Paxton, a high school drop out, has never gone to art school. He resides in the last flophouse on the Bowery, with recent plans for conversion. New York City has the population density, diversity and tolerance to embrace and nurture any self promoter who has good schtick and chutzpah. Self-confidence in tandem with a creative mind will permit virtually any endeavor to become a potential success - there are always patrons to be had, even with the most bizarre products or services. This city is a cauldron, always brewing soups with unconventional unique ingredients. I was amazed at Sir Shadow's fluidity. He is a master of the flow (part of his tag line) and improvisational poetry, describing his work as The One Line Art & Flowetry of Sir Shadow. He creates highly stylized line drawings in one continuous movement, never lifting the pen. A drawing in his signature silver ink is completed in a minute or two. For $20, he will make a personalized piece for a customer, while reciting a poem particular to that individual. See more photos here.